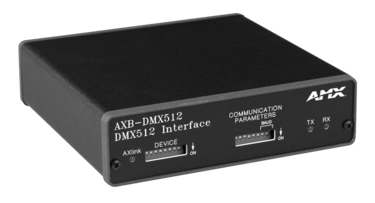 The AXB-DMX512 creates a bi-directional DMX512-to-AxLink connection, transmitting and receiving up to 512 DMX channels. Onboard processing and memory create as many as 96 channel groups, eight faders, and 72 presets (284 by adding extended memory), as well as soft-patch channels. A DMX lighting board can operate in tandem with the AXB-DMX512, generate levels for storing presets, or bypass the AXB-DMX512 for direct control of channels.